At times we all need a little extra spiritual encouragement. The church has fellowship available as well as Bible studies. Here are some encouraging scriptures having to do with spiritual help. Our scientific power has outrun our spiritual power. We have guided missiles and misguided men. ~ Martin Luther King, Jr. The dictionary definition of spiritual is of or relating to the spirit or soul, as distinguished from the physical nature, a spiritual approach to life, of relating to, or consisting of spirit; incorporeal. Romans 7:14-17 We know that the law is spiritual, but I am unspiritual, sold as a slave to sin. I do not understand what I do. For what I want to do I do not do, but what I hate I do. And if I do what I do not want to do, I agree that the law is good. As it is, it is no longer I myself who do it, but it is sin living in me. Our Spiritual Lives Are Like Falling Plates! 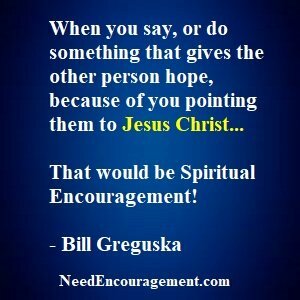 How To Get Spiritual Encouragement? Jesus Is The Bridge That Connects You To God! To experience spiritual encouragement, you need to have a relationship with Jesus Christ! How much do you think you would you benefit from some spiritual encouragement? Sometimes in life, we all need encouragement, often the best support is the spiritual encouragement we get from God from prayer and reading of His word the Bible, and through others that He put strategically into our lives at the exact right time. Keep in mind that the creator of this world loves you and has a plan for your life, not to harm you, but to give you hope and a future. Why I Hate Religion, But Love Jesus? If we are to go forward, we must go back and rediscover those precious values – that all reality hinges on moral foundations and that all reality has spiritual control. Martin Luther King, Jr.
Philippians 2:1-2 Therefore if you have any encouragement from being united with Christ, if any comfort from his love, if any common sharing in the Spirit, if any tenderness and compassion, then make my joy complete by being like-minded, having the same love, being one in spirit and of one mind. It is excellent to both give, and receive spiritual encouragement! Relationship with Jesus Christ is a daily personal way of life between our creator God and ourselves based on the truth of God from the Bible, not from a denomination’s interpretation. Are you a spiritual or religious person? A spiritual person has a close relationship with Jesus Christ as their Lord and Savior. A religious person follows religious rules, and their religion is based on their works, not the work of Jesus! Find spiritual encouragement from God’s word, fellowship, and prayer! Suggested Reading From The Bible! Of course, the entire Bible is the inspired word of God, yet there needs to be a place to start your reading. Here my suggestion for you on where to begin your reading. The Gospel of Matthew, Mark, Luke, and John. The entire Bible is also full of wisdom and truth. As you learn about Jesus Christ through prayer, Bible reading and fellowship with other Christians, God will guide you and give you the wisdom and knowledge you need for every challenge in life. Billy Graham Shares Some Spiritual Encouragement! Spiritual Encouragement From A Man With No Limbs! Spiritual Encouragement Comes From Making Right Choices! Understand that God loves you and has a plan for your life. Jeremiah 29:11 For I know the plans I have for you,” declares the Lord, “plans to prosper you and not to harm you, plans to give you hope and a future. Accepting Jesus as your Lord and Savior. Romans 10:9 If you declare with your mouth, “Jesus is Lord,” and believe in your heart that God raised him from the dead, you will be saved. Start living your life for God and let others Christians help you. Continue to grow in your relationship with Jesus Christ by praying, reading your Bible and Christian fellowship, and share the good news with others. Help and encourage others. 2 Corinthians 1:3-4 Praise be to the God and Father of our Lord Jesus Christ, the Father of compassion and the God of all comfort, who comforts us in all our troubles, so that we can comfort those in any trouble with the comfort we ourselves receive from God. Is edification important in the life of a Christian? What is wrong with being a solo Christian?